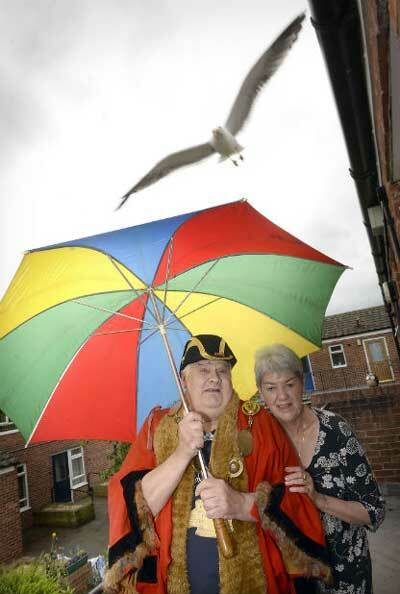 Gulls are attacking sheltered housing residents as soon as they leave their homes in Barton, Gloucestershire. 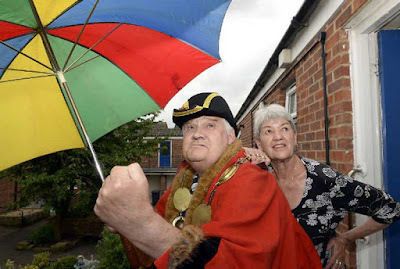 Mock mayor of Barton, Gordon Barrington and his consort Jackie Hutt say they are set upon by gulls every time they step out of the front door. Mr Barrington, 71, who lives in Charter Court, says he is not the only one the gulls are targeting. Visitors, postmen and people making deliveries also have to ward off the airborne pests. He is now calling for the two gull nests near his property to be removed. The issues come following a barrage of complaints over the birds and attempts to control the population. He said: "Every time I step out my front door I'm attacked. I have to carry an umbrella above my head. "Every breeding season it starts again. My next door neighbour is also attacked when he goes out. They're a right royal menace outside our flats. They sit and wait for me either side of my front door. I have to poke my head out, and if something comes towards me, I have to duck back in." Mr Barrington said the birds have targeted him ever since he tried to shoo them away on just one occasion. He said the dive-bombing gulls have been attacking him for two years and now he's calling for the feathery attackers to be removed once and for all. Mr Barrington uses a mobility scooter, suffers from arthritis and has no cartilage in his knee caps, which means some days he's unable to outrun the gulls. That means he is sometimes trapped in his flat whilst he waits for the gulls to disappear before scurrying out. He said he's called Gloucester City Homes, which owns Charter Court, and Gloucester City Council to remove the nests, but has so far got nowhere. Mr Barrington said: "Someone should be sorting out the gull problem - they're an absolute menace. We can't go anywhere without them being around. If I can get something sorted I will be a very happy man. I can't have to be running around like a teenager trying to dodge birds." 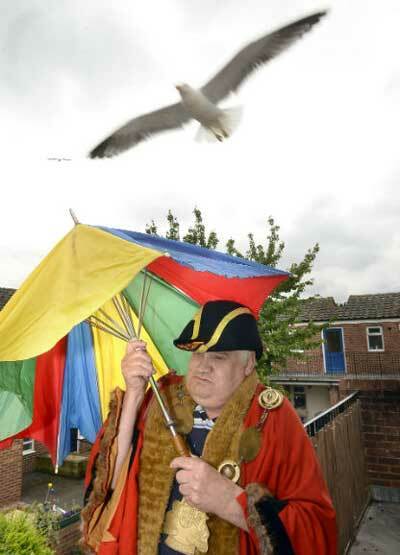 Gloucester town crier Alan Myatt, who lives nearby, said he is also frequently terrorised by the gulls. He said: "It gets so bad I have to take my red coat off and carry it down the road and put it on around the corner. They look for you." Nesting seagulls are protected under the Wildlife Act which makes it a criminal offence to remove a wild bird's nest whilst they are breeding. A spokesman for Gloucester City Homes said the safety of its tenants is of great importance, but added: "Public nuisance and damage, though frustrating for our tenants, are not sufficient legal reason under the act to allow for or warrant removal of a nest. Only where the threat to public health is severe can it be permissible to non-lethally remove a nest, and to our knowledge this is not the situation. Gloucester City Council would be responsible for evaluating this and carrying out such actions were it found to be necessary or if the public health threat increases. We will however look at the locations of the nests, once nesting season has passed, and see what actions can permissibly and legally be taken to prevent further nesting occurring in future years." There's a most peculiar video featuring Mr Barrington and his consort Ms Hutt contemplating the gull problem here. What on earth is he wearing? It could be the gulls are fashion police. It's his faux mayor's outfit, Barbwire.